Sprockets Are Manufactured With High Precision In British And American Standard In All Types. 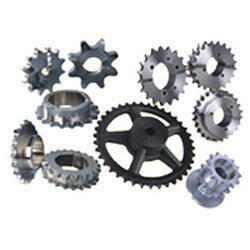 Sprockets Are Hob Cut And Tooth Are Hardened And Ground For Better Wear Life And Durability. 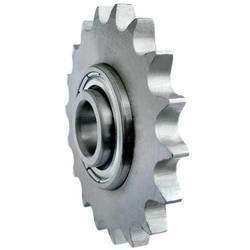 We are engaged in offering our clients with a quality range of American Standard Sprockets, which are highly demanded in diverse industries, our range is manufactured with quality material, and is highly appreciated for its quality, durability, performance and long functioning life. We offer an extensive range of simplex Sprockets that are in great demand in the market for the extremely sharp teeth for accurate and quick cutting of tough material. These are manufactured with graded stainless steel, mild steel and cast iron that provide high tensile strength and efficiency. The sprocket looks like a gear but has many engaging teeth while gears usually have one or two. There is basically no slippage in a sprocket. The chain changes the rotational power to pulling power and pulling power to rotational power, by engaging with the sprocket. Our sprockets help in avoiding early elongation of chain. They minimize break downs and reduce the power consumption, resulting in high productivity. These are offered at reasonable rates. Our specialized simplex sprockets can be efficiently used in varied industrial process. The simplex sprockets are available in a range of varying pitch as in inches, and in different length. They are made from steel, stainless steel and metal. Common Applications - Sprockets are used in various applications of Cement Plants, Sugar Mills, Sponge Iron Plants Fertilizer plants, Thermal Power Station, Mineral Plants and other manufacturing industries.